Download "Advanced Merger Model Quick Reference Common Formulas & Model Setup. http://breakingintowallstreet.com. Transaction Structure & Assumptions"
3 Assets Cash: Add Buyer + Seller s Cash and subtract any cash used in transaction. Short-Term Investments / Other Cash-Equivalents: Add Buyer + Seller balances. Accounts Receivable: Add Buyer + Seller balances; sometimes adjust for inter-company receivables. Inventory: Add Buyer + Seller balances. Other Current Assets: Add Buyer + Seller balances. Capitalized Financing Fees: Add this item to Assets and create it in transaction. 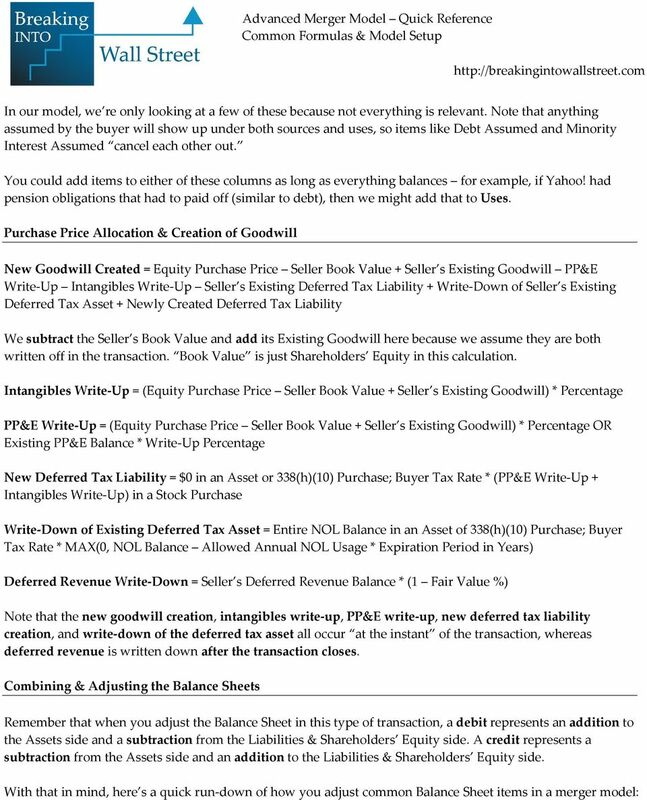 Net PP&E: Add Buyer + Seller balances and add PP&E Write-Up. 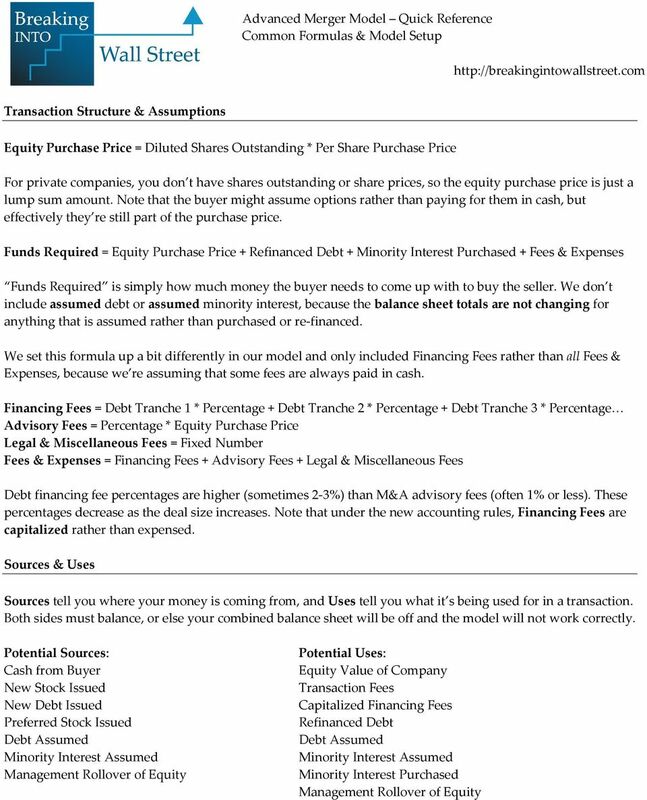 Equity Investments: Add Buyer + Seller balances. Goodwill: Add Buyer + Seller balances; subtract Seller s balance; add Newly Created Goodwill. 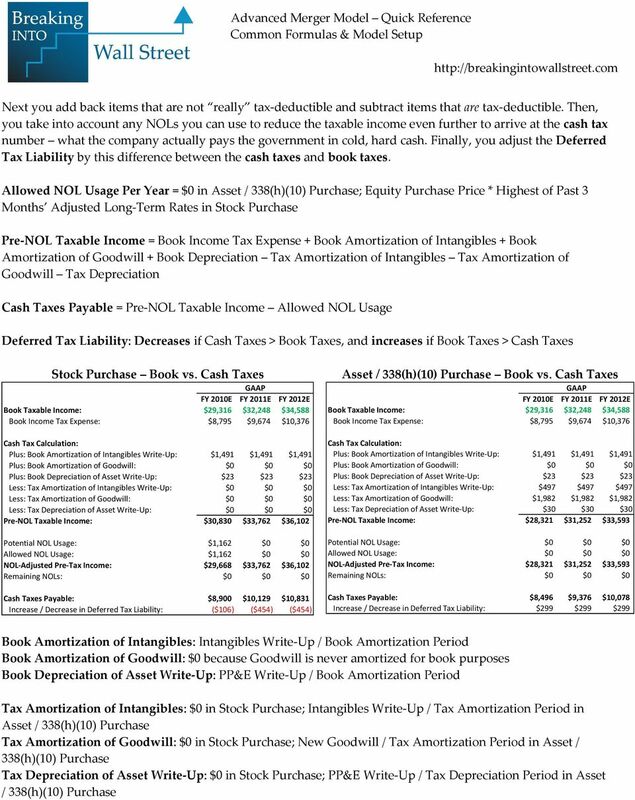 Net Intangible Assets: Add Buyer + Seller balances and add Intangibles Write-Up. 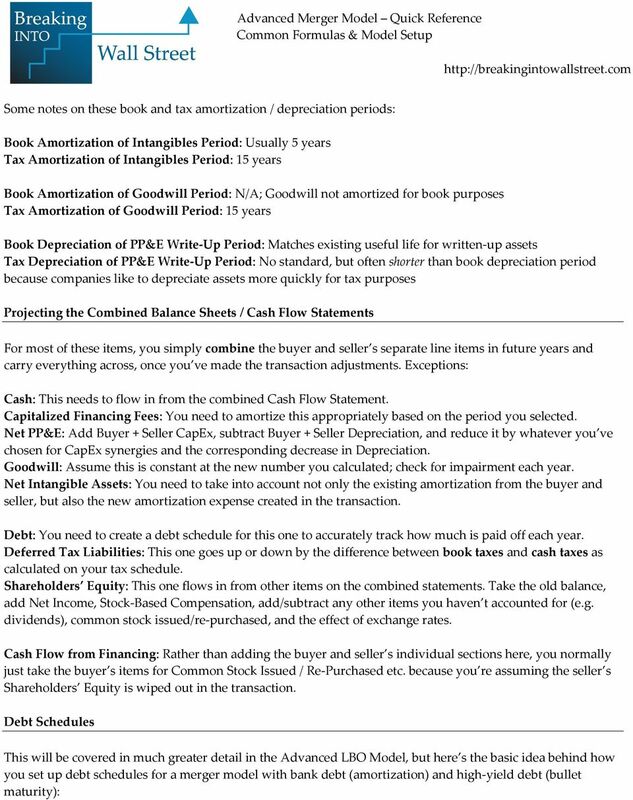 Deferred Income Taxes: Add Buyer + Seller balances; could also adjust for DTA Write-Down here. Other Long-Term Assets: Add Buyer + Seller balances. Liabilities & Shareholders Equity Accounts Payable: Add Buyer + Seller balances; sometimes adjust for inter-company payables. Accrued Expenses: Add Buyer + Seller balances. 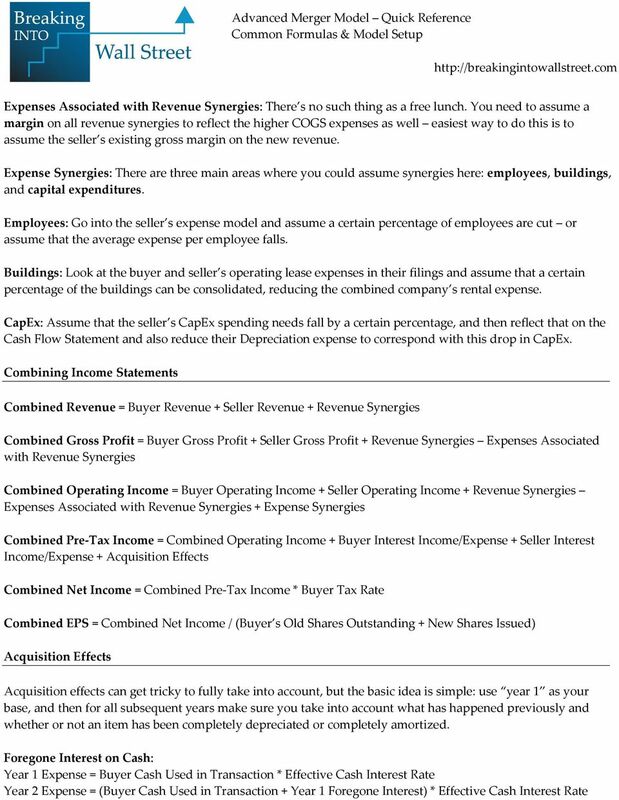 Deferred Revenue: Add Buyer + Seller balances (deferred revenue written down after transaction close). Other Current Liabilities: Add Buyer + Seller balances. Debt: Add Buyer + Seller balances; subtract any refinanced debt; add newly issued debt. Deferred Tax Liabilities: Add Buyer + Seller balances; subtract Seller s Balance; add newly created DTL; add write-down of seller s DTA if you haven t already adjusted on the Assets side. Other Long-Term Liabilities: Add Buyer + Seller balances. Minority Interests: Add Buyer + Seller balances; subtract any purchased Minority Interests. 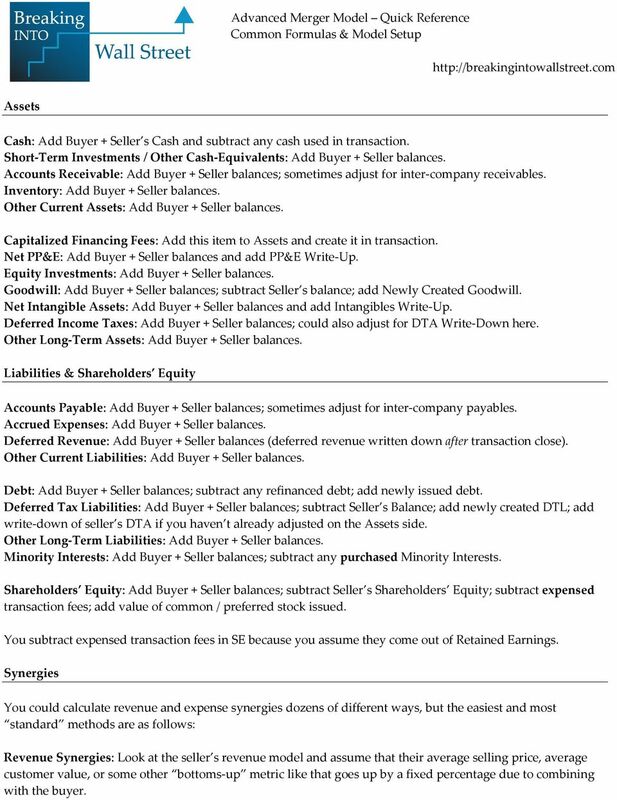 Shareholders Equity: Add Buyer + Seller balances; subtract Seller s Shareholders Equity; subtract expensed transaction fees; add value of common / preferred stock issued. You subtract expensed transaction fees in SE because you assume they come out of Retained Earnings. Synergies You could calculate revenue and expense synergies dozens of different ways, but the easiest and most standard methods are as follows: Revenue Synergies: Look at the seller s revenue model and assume that their average selling price, average customer value, or some other bottoms-up metric like that goes up by a fixed percentage due to combining with the buyer. 5 And the pattern continues like that each time you need to add all the previous foregone interest expenses. New Interest Expense on Debt = Average Balance of Tranche 1 * Tranche 1 Interest Rate + Average Balance of Tranche 2 * Tranche 2 Interest Rate + Average Balance of Tranche 3 * Tranche 3 Interest Rate Technically you should make a debt schedule to determine these average yearly balances of each tranche of debt but in practice you usually make a simple percentage estimate without bothering with a debt schedule. 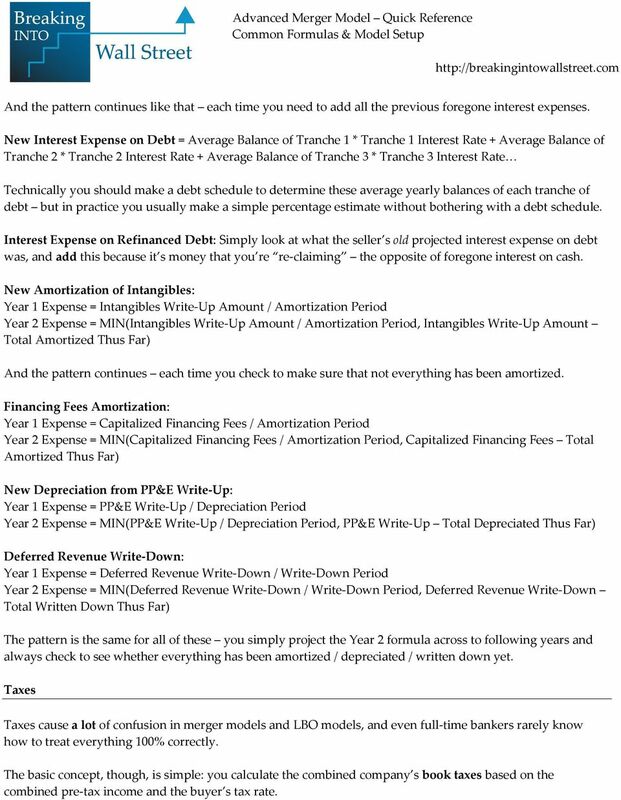 Interest Expense on Refinanced Debt: Simply look at what the seller s old projected interest expense on debt was, and add this because it s money that you re re-claiming the opposite of foregone interest on cash. New Amortization of Intangibles: Year 1 Expense = Intangibles Write-Up Amount / Amortization Period Year 2 Expense = MIN(Intangibles Write-Up Amount / Amortization Period, Intangibles Write-Up Amount Total Amortized Thus Far) And the pattern continues each time you check to make sure that not everything has been amortized. Financing Fees Amortization: Year 1 Expense = Capitalized Financing Fees / Amortization Period Year 2 Expense = MIN(Capitalized Financing Fees / Amortization Period, Capitalized Financing Fees Total Amortized Thus Far) New Depreciation from PP&E Write-Up: Year 1 Expense = PP&E Write-Up / Depreciation Period Year 2 Expense = MIN(PP&E Write-Up / Depreciation Period, PP&E Write-Up Total Depreciated Thus Far) Deferred Revenue Write-Down: Year 1 Expense = Deferred Revenue Write-Down / Write-Down Period Year 2 Expense = MIN(Deferred Revenue Write-Down / Write-Down Period, Deferred Revenue Write-Down Total Written Down Thus Far) The pattern is the same for all of these you simply project the Year 2 formula across to following years and always check to see whether everything has been amortized / depreciated / written down yet. Taxes Taxes cause a lot of confusion in merger models and LBO models, and even full-time bankers rarely know how to treat everything 100% correctly. The basic concept, though, is simple: you calculate the combined company s book taxes based on the combined pre-tax income and the buyer s tax rate. We need to allocate the purchase price in an M&A deal because we often pay more for the seller than what their balance sheet says they re worth. 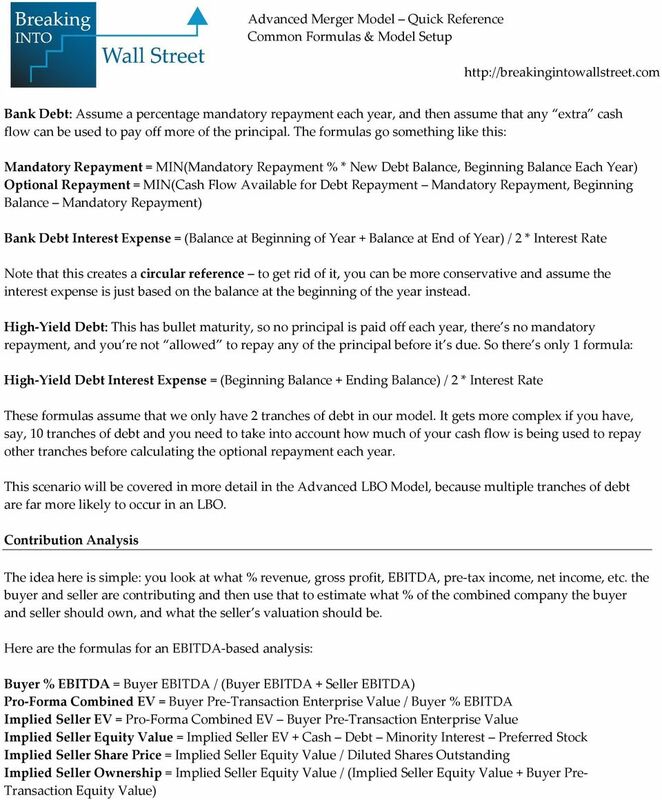 Leveraged Buyout (LBO) Model Overview A leveraged buyout model shows what happens when a private equity firm acquires a company using a combination of equity (cash) and debt, and then sells it in 3-5 years. Bank & Financial Institution Modeling Quick Reference Projecting Financial Statements for a Bank. http://breakingintowallstreet.